Miners have been talking seriously about innovation since the downturn of 2012, but it’s taken a while for that talk to translate into action. At the recent Mining Suppliers Trade Association (MSTA) of Canada forum, some of the leading purveyors of technology to the mining sector confirmed that it’s finally starting to happen. “What I’m seeing now is a little bit of fear in the marketplace,” said Michael Gribbons, vice-president of sales and marketing at Maestro Digital Mine. Tomas Cabanillas a sector advisor at Export Development Canada who helps provide financing to clients in Chile and Peru who are using innovative solutions from Canadian suppliers, said the same applies internationally. “What we’re seeing is, after moving to reactivate or build or expand new mines, many of these companies now have the additional mandate from management or from champions within that management to start looking at the concept of innovation from leadership all the way down,” Cabanillas said. 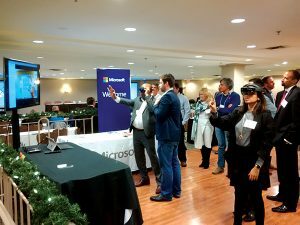 That new openness is reflected in the presence of Microsoft at the conference, held in November in Mississauga, Ont. “Microsoft would not have been like something like this five years ago,” confirmed Mark Speaker, Industry Solutions executive with Microsoft. “The whole environment’s changing – there’s a lot of new players, a lot of very large players,” said Walter Siggelkow, “Cisco is taking a huge role, upfront, at the mine sites and putting equipment in. Speaker noted that mining companies are approaching Microsoft looking for solutions from other industries. “A number of (companies) have asked us: help us innovate,” Speaker said. “The best ones have really thought about it and said, ‘Don’t try to understand mining better than we do, because you never will: Bring us the best that people are doing from other industries.’” As an example, Speaker said companies have been inquiring about “lights out” facilities – highly automated operations that work without the physical presence of people, and how the principle could be applied to mining. To reflect the changes that are taking place in the industry, the conference organizer rebranded as MSTA Canada in September, after nearly four decades as CAMESE (Canadian Association of Mining Equipment and Services for Export). With the rebrand comes a new focus on providing its members networking opportunities with the mining industry and a more aggressive advocacy strategy on behalf of its more than 300 corporate members. Aside from future trends such as “lights out” mining, and the recent entry of new and big players into the mining space, MSTA delegates also heard about one of the basic stumbling blocks miners are coming up against in their quest for innovation – the ownership of data. Ryan McEachern, managing director of MSTA Canada, noted that he’s heard complaints from several large mining companies that they don’t have access to all the data generated on their equipment and systems – data which could be useful in all types of analytics. Hard-Line’s Siggelkow said that mining companies need to push back when OEMs are reluctant to give them access to the data generated in the course of operations. Companies who are refused data are in the position of having to hack their own machinery to get the data they need, said Microsoft’s Speaker. Part of the problem, Siggelkow added is the lack of interoperability between different OEMs systems and the lack of an open standard or common platform such as those that exist in the auto industry. “Different companies have different expertises; some of them do some things very well, but not everyone does everything perfectly, so you have to build APIs (interfaces between two pieces of software) – you need that in between them so there’s a standard that says how do we play nicely together?” Siggelkow said. While mining companies have warmed up to innovation, they may have to adjust their mind sets a little bit more to get to the “fail fast” model that has allowed software companies to be so successful at innovation. “The other thing I would say is, yes, you’re going to get failures – in fact you have to enable experimentation,” said Speaker. “The largest companies kind of realize this – they get a portfolio of projects and if there’s ten of them, they’re going to have three or four absolute all-out failures, and then you’re going to have some base hits and you’re going to have some home runs.